For the seventh time in 13 years, Americans living in homeowners associations and condominiums have told pollsters they are overwhelmingly satisfied in their communities. The March 2018 survey affirms the findings of almost identical national surveys conducted in 2005, 2007, 2009, 2012, 2014, and 2016. The 2018 survey was conducted by Zogby Analytics for the Foundation for Community Association Research. The findings from the six surveys are strikingly consistent and rarely vary a standard margin error for national, demographically representative surveys. By large majorities, most residents rate their overall community experience as positive or, at worst, neutral. They say their association board members serve the best interests of their communities. They say their community managers provide valuable support to residents and their associations. They support community association rules because they protect and enhance property values. The findings objectively refute the unfounded and unsubstantiated myth that the community association model of governance is failing to serve the best interests of Americans who choose to live in common-interest communities. 2012: Who Should Judge Community Association Success? 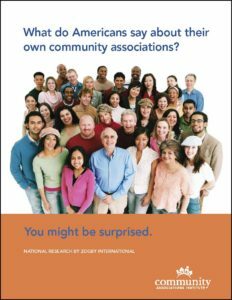 2009: What do Americans say about their own community associations?